One of the questions tomato growers frequently ask is “why do my tomato leaves turn yellow?”. There are many possible reasons why tomato leaves might turn yellow. 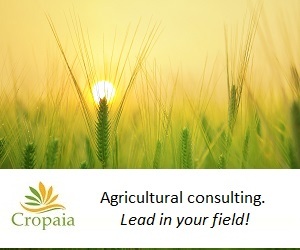 These include excessive watering, nutrient deficiencies, fungal diseases and viral diseases. Are there spots on the leaves? Are there any additional symptoms, such as necrosis, tip burn or wilting? Does the yellowing of leaves first appeared on lower or on upper leaves? What is the pattern of the yellowing – Does the entire leaf become yellow uniformly? Is it interveinal chlorosis? Are there yellow patches on the leaves? Is the yellowing around necrotic spots? Is it a mosaic? Sometimes it is not easy to spot the differences and accurately respond to these questions. However, it is well worth the effort, because recognizing the correct reason why tomato leaves turn yellow will help choosing the correct treatment. When too much water is applied, water replaces oxygen in the soil. The lack of oxygen kills roots so they are unable to absorb water and nutrients. As a result, leaves become soft and turn yellow uniformly, i.e. the entire leaf turns yellow. Excessive irrigation does not only turn tomato leaves yellow, but also causes cracked tomato fruits, wilting of the plant and blossom end rot. Deficiencies of some nutrients might result in leaf yellowing of tomato plants. The position of the yellowing leaves on the plant and the yellowing pattern can tell a lot about the possible causes. 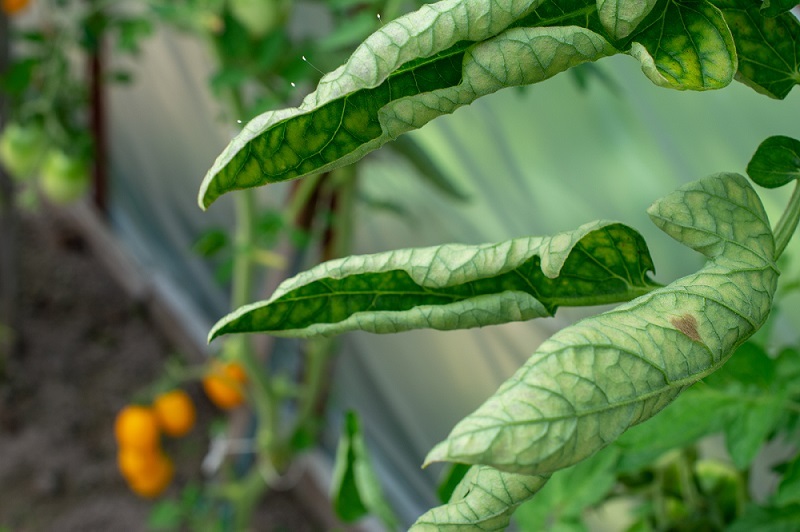 Nitrogen deficiency – older tomato leaves turn pale and yellow first. Yellowing gradually spreads to younger leaves. 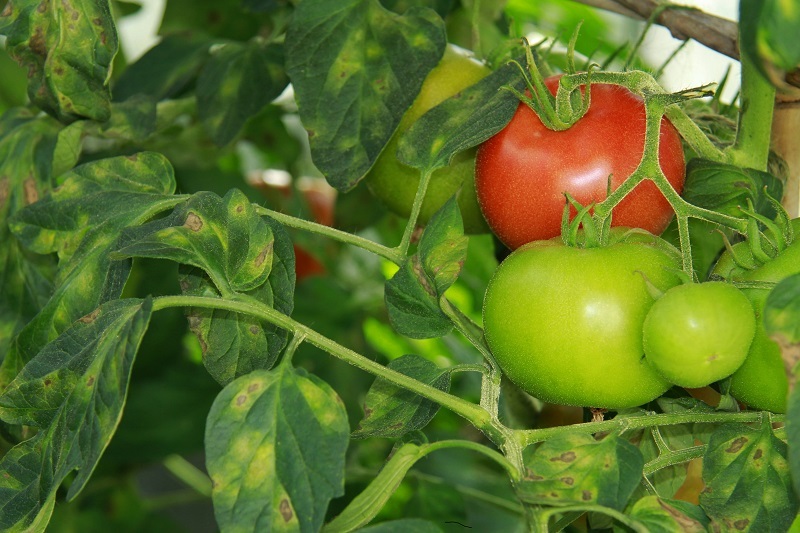 Sulfur deficiency – symptoms resemble nitrogen deficiency, where tomato leaves become uniformly pale green or yellow. In contrast to nitrogen deficiency, sulfur deficiency symptoms appear on the upper leaves first and progress towards lower leaves, until the entire plant appears uniformly chlorotic. Iron deficiency in tomato is characterized by interveinal chlorosis of younger leaves and chlorosis at the base of the leaf. Severe iron deficiency results in leaves becoming completely bleached (very pale yellow). Magnesium deficiency in tomato plants also results in leaf yellowing. Interveinal chlorosis begins near the margins of older leaves and spread towards the middle of the leaf. Brown necrotic spots may also develop in between veins of leaves that show symptoms. In potassium deficiency, the edges of older leaves become chlorotic and at a more advanced stage, tomato leaf tips and edges develop a brown necrosis. Unlike in nutrient deficiencies, yellowing of tomato leaves which is a result of a fungal disease is not uniform in pattern and distribution over the leaf. Chlorosis may appear around lesions and leaf spots, on one side of the plant, one side of the leaf etc. Verticillium wilt – symptoms include V-shaped yellow lesions between veins, that progress to brown lesions. Symptoms first appear on lower leaves, starting from the margin of the leaves. This disease is favored by cool temperatures. Fusarium wilt causes yellowing of leaves usually on one side of the tomato plant. Older leaves will show symptoms first. As the disease progresses, branches wilt. Various viral diseases of tomato cause leaf yellowing. 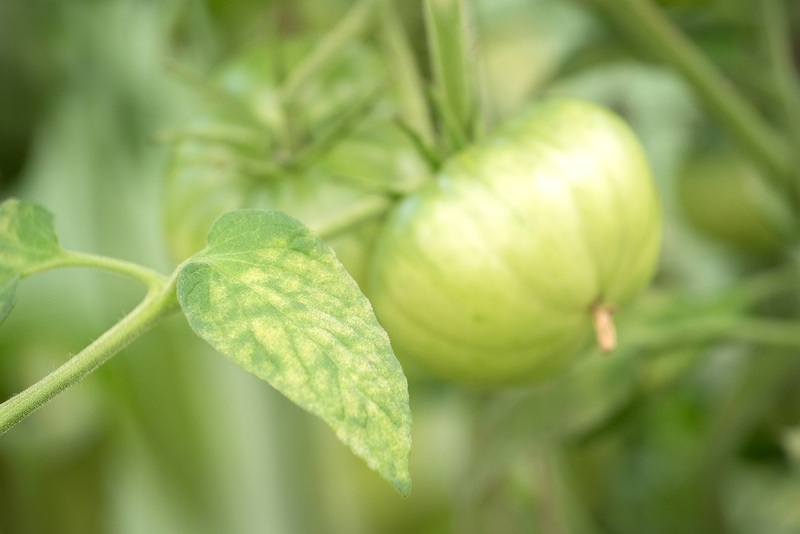 For example, symptoms of ToCV (Tomato Chlorosis Virus) and TICV (Tomato Infectious Chlorosis Virus) start with interveinal chlorosis of older leaves. These symptoms can be easily confused with magnesium deficiency symptoms. As the disease progresses, leaves start to thicken and roll up. Tomato Yellow Leaf Curl Virus (TYLCV) c uses severe damage to tomato. Symptoms include stunting, curling and yellowing of leaves. These viruses are transmitted by whitefly. To summarize, there could be many reasons why tomato leaves may turn yellow. Paying attention to the exact pattern of the symptoms and having knowledge of the conditions that affect the possible causes is the key to correct identification and treatment.